When we think of romance, it is rare to apply the sentiment to our parents or even our grandparents. Although not often thought of, and less often spoken of, some of the most romantic gestures are the simpler, old-fashioned ones. "Back in the day" when a young man wanted to ask a girl to a dance he used the simple method of asking! Just a simple, "would you like to go to the dance with me?" Today, extreme pressure is put on the young man to come up with a unique and creative way to ask for a date. If a boy wants to ask a girl to prom, he'll do some crazy things; such as giving her a pizza that says the words, " Will you go prom with me?" spelled with pepperonis, or sending flowers to the office with a card inside, getting his friend to ask her for him, or sending her on a treasure hunt following sticky notes with instructions and finally finding the one that asks her to prom. One high school boy had a live goldfish delivered to his prospective date with the message attached that read, "Of all of the fish in the sea, will you go to prom with me?" But, sometimes this is switched... instead of the guy asking the girl, sometimes the girl asks a guy to prom, but she doesn't go as overboard as he does. Girls will do things like asking them face to face, getting a friend to ask if they have a date, or doing something fun like writing on his truck window with window chalk. This night is extremely special for the girls, and prom is the most important dance for them. That is probably why so much pressure is put on the guys in the asking process. Girls take just about the whole day to get ready for one night. She spends time fixing her hair and makeup, getting her nails done, and everything else, while all the guy has to do is brush his hair and put on his tux. 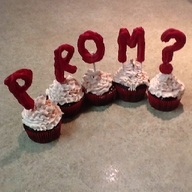 We like the creative, yet simple date requests that require a little thought, little or no money, and team coordination! After all, in high school everyone should be included, right?